Frozen desserts are the most acceptable of any that can be presented in the summer-time, and at any season they are served and expected at dinner entertainments. The trouble of making them is not greater than that of making any dessert of the same class, and the expense no more than any dessert using the same amount of eggs and cream; thus a plain ice-cream is the same as a custard, a mousse the same as whipped cream, etc. Parfaits are especially delicious creams, and as they require no stirring while freezing are very quickly and easily made. The freezing of ice-creams which require stirring is accomplished in twenty to twenty-five minutes, and is much easier work than beating eggs for cake. In fact, the whole process of making ice-creams is easier than that of making cake, but the latter is so generally practised that nothing is thought of it. It will be the same with ice-cream if the habit is once formed. They have the advantage over hot desserts that they require no attention at dinner-time. Philadelphia ice-creams are cream sweetened, flavored, and stirred while freezing. French ice-creams are custards of different degrees of richness stirred while freezing. Parfaits, biscuits, and mousses are whipped cream, with or without eggs, frozen without stirring. Water-ices are fruit-juices sweetened with sugar syrup, stirred while freezing. Punches and sherbets are water-ices with liquors mixed with them either before or after they are frozen. These creams, in different degrees of richness and with different flavorings, give an infinite variety, and their combinations and forms of molding give all the fancy ices. Unless the cream is to be whipped it should be scalded, as it then gives a smoother and better ice; otherwise it has a raw taste. It is scalded as soon as the water in the outside kettle boils. If the cream is too much cooked it will not increase in bulk when stirred, therefore do not boil the cream. When whipped cream is used it should be very cold, whipped to a stiff, firm froth with a wire whip, and the liquid which drains from it should not be used. (See whipping cream, page 408). Ices are much better when the sugar is added in the form of syrup. (See sugar syrup, page 503; and boiling syrup, page 513.) Frozen fruits are smoother when sweetened with syrup, and water-ices should be made of a thick syrup diluted with fruit-juice to 20° on the syrup gauge. In custard creams the milk should be scalded, and when a little cool stirred into the beaten yolks (the whites of the eggs are not generally used). The whole is then placed on the fire, and stirred continually until it coats the spoon no longer. The flavoring is then added, and it is beaten until cold. This makes it light and smooth, and increases its bulk. For biscuits and parfaits the custard is made of sugar syrup and yolks of eggs cooked together until it coats the spoon, and is then beaten until cold. Put the ice in a strong cloth or bag, and pound it quite fine. The finer the ice the quicker will be the freezing. Snow may be used in place of ice. Use one part of rock salt (fine salt will not do) to three parts of ice. Rock salt can be had at feed-stores when not found at grocers'. Place the can in the freezing pail with the pivot of the can in the socket of the pail, have the cover on the can, and a cork in the opening on top. Hold the can straight, and fill around it three inches deep of ice; then an inch of salt. Alternate the layers of ice and salt, observing the right proportions, until the packing rises to within an inch of the top of the can; pack it down as solid as possible. See that the can will turn, and be careful not to lift it out of the socket. Take off the top of the can; put in the paddle, placing the pivot in the socket at the bottom; then pour in carefully the ice-cream mixture, which must be perfectly cold. Adjust the tops and crank, and turn it for twenty to twenty-five minutes, by which time the cream should be frozen. The crank turns harder when the mixture has stiffened, and it is not necessary to look in order to know it is frozen. If the cream is frozen too quickly it will be coarsegrained. To have it fine-grained it must be turned constantly, and not frozen in less time than twenty minutes. When the cream is frozen take off the crank and the top of the pail. Wipe carefully the top of the can, and see that the ice and salt are well below the lid, so none will get into the cream; lift off the top, take out the paddle, and with a spoon or wooden spatula work down the cream. If fruit, whipped cream, or anything is to be added to the cream, put it in at this time and work it well together. If the cream is to be molded, remove and place it in the molds; if not, smooth the top, and make the cream compact with a potato masher. Replace the top, put a cork in the opening of the lid, draw off the water in the pail by removing the cork from the hole in the side of the pail, add more ice and salt. Cover it with a heavy cloth, and let it stand until ready to use. The cream ripens or becomes blended by standing, so should be made before the time for serving. Look at it occasionally to see that the water does not rise above the opening of the can. If properly watched, and if the packing is renewed as required, the cream can be kept for any length of time. Put the frozen ice-cream into the mold, filling it entirely full; press it down to force out any air bubbles. Rub butter around the edge where the lid fits on. Lay a wet thin paper over the top, and put on the lid. Fill the edges around the lid with butter or lard. This will harden, and make the joints tight. Too much care cannot be taken to prevent the salt water leaking into the mold. Imbed the mold in ice and salt for from one to six hours. Mousses require four to six hours, and par-faits two to three hours. Watch to see that the water does not rise above the lid of the mold, and draw it off when necessary. When two or more kinds of creams are to be combined in the same mold, first place the mold in ice and salt; line it an inch or more thick with one kind of cream, and fill the center with a cream of different flavor and color. These are called bombs. Or, place two or more kinds in even layers. Where two colors are used they are pana-chee; if three, they are neapolitan. If the colors are to run in vertical strips, which is desirable in pyramidal molds, cut a piece of stiff paper or cardboard to the shape of the mold; fill each side with a different cream, and then withdraw the paper. Arrange layers of creams so that when unmolded the most solid one will be at the bottom, as it has the weight of the others to sustain; for instance, do not put water-ices or parfaits under French creams. Biscuits are put into paper boxes, and individual creams into lead molds. The latter must be thoroughly chilled, then filled according to fancy or color suitable to the form. They are then closed, and put into a freezing-box, or into a pail, the joints of the pail tightly sealed with butter, and packed in ice and salt. A freezing-box with shelves is desirable to have for these creams, but a lard-pail answers very well for a small number of molds, as the lid fits over the outside, and so can be made tight. Molds packed in this way require to stand longer than those which come in direct contact with the ice and salt. ICE-CREAM MOLDS IN BRICK FORMS AND INDIVIDUAL LEAD MOLDS. ICE-CREAM MOLDED IN A RING MOLD, THE CENTER FILLED WITH WHIPPED CREAM COLORED PINK, AND THE DISH GARNISHED WITH PINK ROSES AND LEAVES. The individual creams have to be frozen very hard, and when unmolded should be brushed with a little color to simulate the fruit or flower they represent. Thus, a peach or a pear would be of French cream, which is yellow in color, and the sides brushed with a little diluted cochineal to give pink cheeks, and a piece of angelica stuck in to represent a stem. A flower would be molded in white cream, and the center made yellow. A mushroom stem would be dipped in powdered cocoa, etc. Individual creams are perhaps too difficult for an amateur to undertake, and hardly repay the trouble when so many ornamental creams are more easily made. Dip the mold into cold water; wipe it dry and invert it on the dish. If it does not come out at once let it stand a moment, or wring a cloth out of warm water, and wipe quickly around the mold. This must be done quickly, or the sharp edges of the molded cream will be destroyed. With parfaits and mousses it is better not to use a hot cloth, as they melt very easily. It destroys the attractiveness of ices to have the dish swimming in melted cream, or to have the mold soft and irregular in shape, which partial melting produces. Hence the unmolding of creams requires great care. A plain ring-mold of icecream in any color can be made an ornamental cream, by filling the center with berries or with whipped cream for sauce. The whipped cream may be colored to give pleasing contrast. For instance, a white ice-cream-ring filled with pink whipped cream and a few pink roses laid on one side of the dish, or a ring of pistachio ice-cream filled with white whipped cream or with strawberries, and a bunch of green leaves laid on one side of the dish. A melon mold may be lined with pistachio ice-cream, the center filled with pink ice-cream mixed with a few small chocolates to represent seeds, or with French ice-cream, which is yellow, and mixed with blanched almonds. 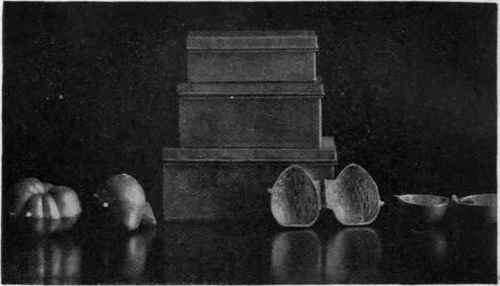 The surface of the melon when unmolded is sprinkled with chopped browned almonds to simulate a rind. This dish may be garnished with leaves. Spun sugar can be employed to ornament any form of cream. It may be spread over or be laid around it, and makes a beautiful decoration. Individual Creams, representing eggs or snow-balls, can be served in a nest of spun sugar. Glace grapes or oranges can be arranged on the same dish with individual creams representing peaches and pears, the whole lightly covered with a little spun sugar. Individual ice-creams, representing roses, can be held by artificial stems, stuck into a rice socle, with natural roses and leaves interspersed, giving the effect of a bouquet. Individual creams are also served in baskets of nougat or of pulled candy. The baskets can be ornamented by tying a bunch of roses with a ribbon on the handle. Individual creams representing strawberries are served on flat baskets, or piled on a flat dish and trimmed with natural leaves. Forms of ice-cream representing animals and vegetables are in questionable taste, and are not recommended. The coffee and the chocolate pralinee. The white ice-cream, plain or mixed with candied or preserved chestnuts, or with candied fruits cut into dice. The maple parfait, which is quite new. Fruit ice No. 2. Chocolate mousse. Maraschino, Curacao, and noyau make delicious flavorings for cream.